Its amazing how many things can be made out in sugar. Its amazing to have a sugar paste in your hands and minutes, hours and sometimes days later, this paste is transformed in an incredible creation. And this was the case. I was asked for a well known American actor who also has a tv show, to make his birthday cake. 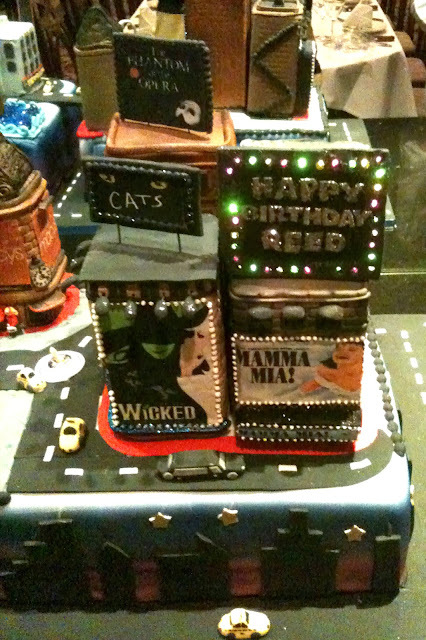 He loves to travel around the world but he also loves Broadway musicals, etc., so he wanted to have a cake of Manhattan. OMG!! I have to recreate Manhattan in sugar, really?? but I looooooove these kind of projects so I started right away. Es realmente increíble las cosas que se pueden hacer con la pasta de azúcar. Es increíble tener en la mano una pasta que minutos, horas, a veces días se convierte en una sorprendente creación, y éste es uno de esos casos. Un conocido actor américano que también tiene un programa de Tv me pidió que le hiciera el cake para su fiesta de cumpleaños. 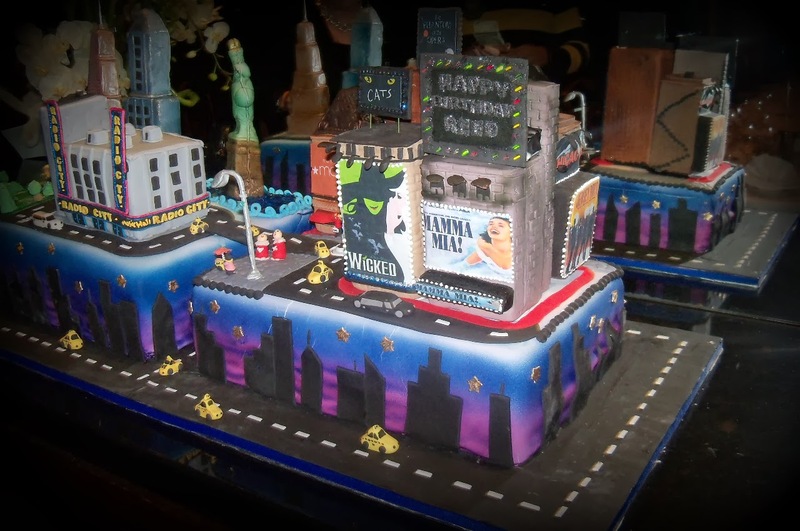 A él le encanta viajar y le encantan los musicales de Broadway, por eso en este caso quería una tarta que representara Manhattan. Representar está bien, pero recrear Manhattan en azúcar es otra cosa....Dios mio, y ahora qué?? pero a mi me encantan este tipo de proyectos y enseguida me puse manos a la obra. 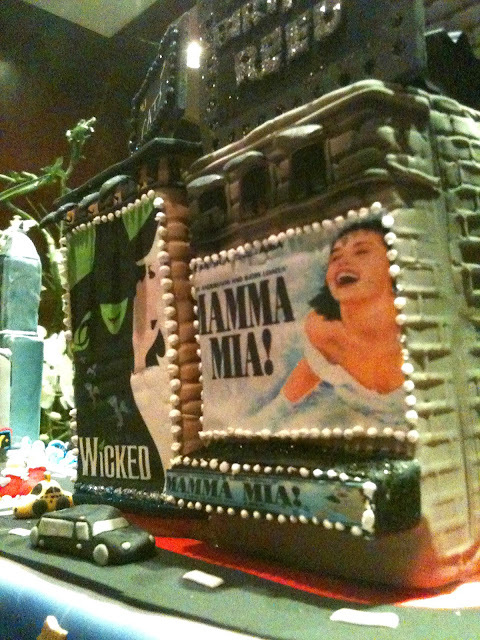 I have to say that the worse thing of all, is to have such bad photos of the cake. For different reasons, my pictures are horrible sorry for that and I hope you can appreciate the final work. Manhattan is on top of two cakes and the total size of that was 3 1/2 feet. Yes, it was soooo big!! 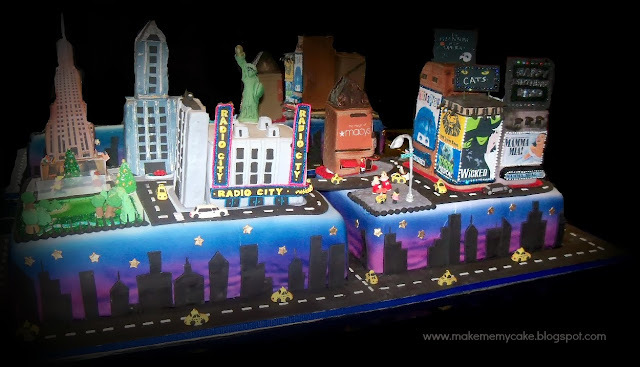 A highway join the two cakes wich is a way to go from up town to the Broadway district. I have to say that everything in this cake is edible except the lights of the happy birthday on top of Mamma Mia and the two Little lights which lighted the Rockefeller center tree. Manhattan va sobre dos cakes cuya longitud total es de 1 metro y 10 cm. Y si realmente era enorme!! Una carretera unía las dos piezas que unen la parte alta de la ciudad con el distrito de Broadway. Absolutamente todo lo que va en la tarta es comestible con la excepción de las luces del cartel de happy birthday y las lucecitas que iluminaban el árbol de navidad de Rockefeller center. Please don´t think that my pictures are all like this, see other post to compare!! 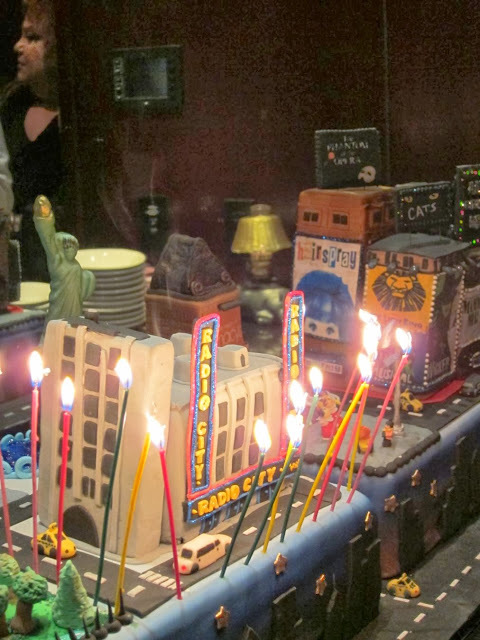 I would love to have good picture of this cake but I will try to explain to you the details. Por favor no penseis que todas las fotos que hago son igual the horribles, mirar otros post para comparar jajaja, la verdad es que me encantaría tener buenas fotos de esta tarta, pero intentaré explicaroslas de viva voz escrita. 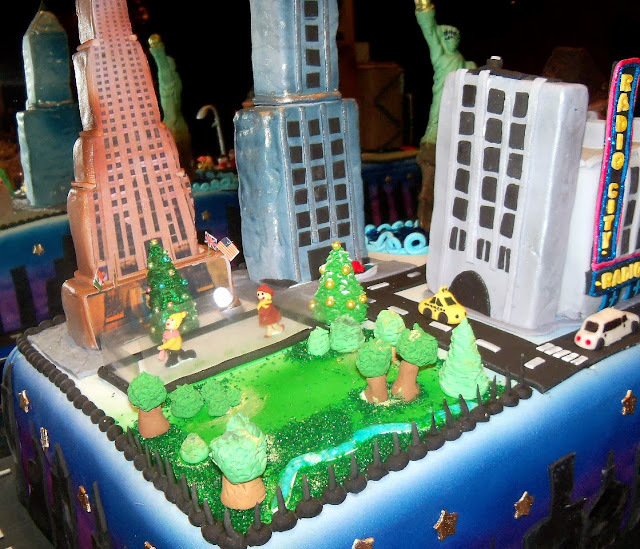 The buildings are made out of rice crispy covered in fondant. 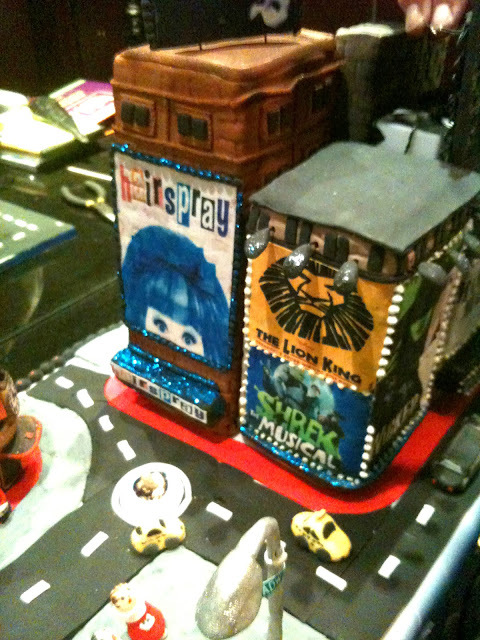 I added textures to some of them and edible images to others as the Broadway shows signs. Los edificios están hechos con cereales crispies y cubiertos con fondant. He añadido texturas a algunos e imagenes comestibles a otros. I also airbrused some buildings to get the smoky effect of the city. 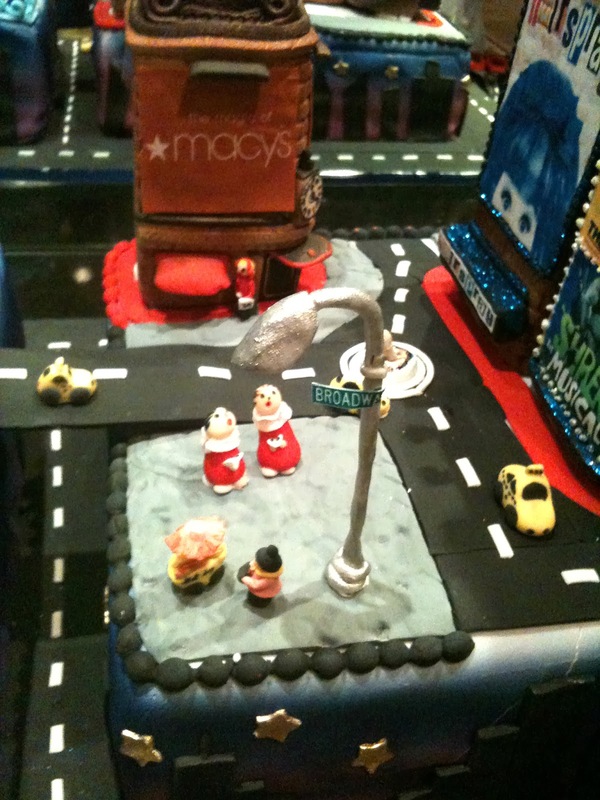 Cars, pedestrians, christmas singers and hot dog stands are made out in fondant. Tanto los coches, transeuntes, el coro y los carritos de perritos calientes están hechos con fondant. 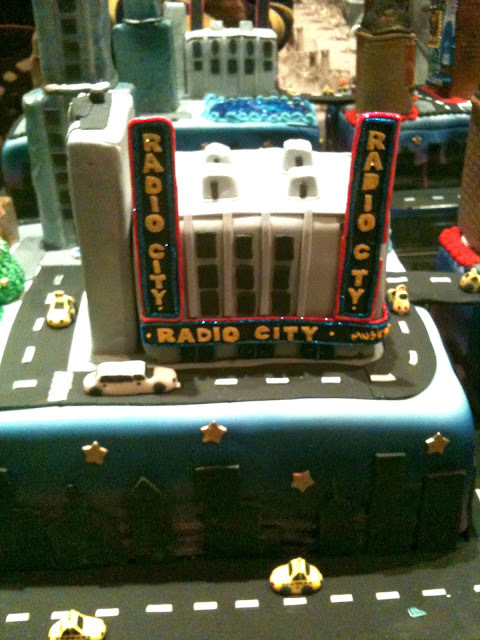 .Radio City is in the uptown. Rockefeller center with the ice skaters, the tree and a little bit of Central Park. Behind we see the Statue of Liberty made out in gumpaste. Esto es Rockefeller center con la pista de patinaje sobre hielo, el arbol de navidad y un trocito de Central Park. Detrás vemos la estatua de la libertad hecha en pasta de goma. 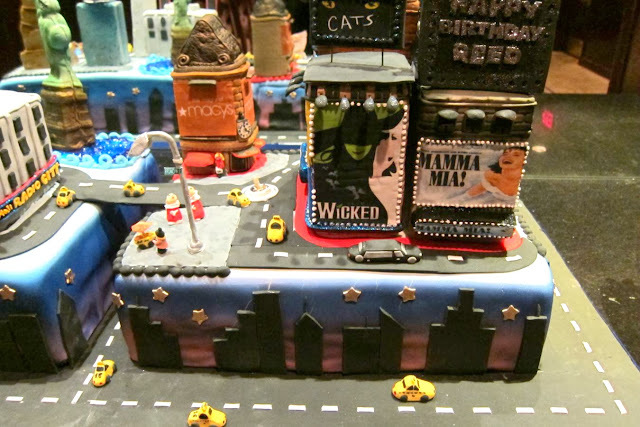 The bottom tier is the skyline of the city at night painted with airbrush and the typical yellow taxis on the streets. Well this is the Manhattan cake, I hope you could appreciate the details of the cake. I appreciate the pictures that he sent me after the party. El piso de abajo es el skyline the la ciudad por la noche hecho con airbrush y los taxis amarillos tan típicos de la ciudad. Espero que hayais podido apreciar los detalles de la tarta en estas fotos tan horribles :( Aunque le agradezco que me haya enviado algunas fotos después de la fiesta. Thank you for stopping by and hope to see you in my next post which will have wonderful pictures lol I promise!!!! Gracias por leer mi blog y espero veros en el siguiente post que prometo tendrá mejores fotos, lo prometo!!! Labels: city cake, Manhattan, Manhattan cake, New york, New York cake, the big apple cake, The big apple.